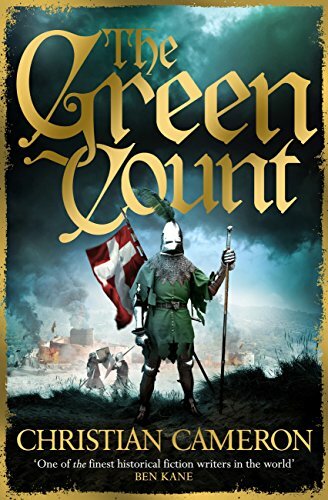 The Green Count is the latest novel (released in July 2017) in Christian Cameron’s popular “William Gold” series, set during the events of the Hundred Years War. MAKE A DONATION ONLINE to help pay for the production of this podcast. Anyone who has read Christian Cameron’s historical adventure novels, such as the William Gold series, knows that creating a detailed medieval setting is one of his fortés. He is an author quite skilled at describing battles, armor, and fighting tactics, and at getting inside the personalities and motives of the men and women who lived in that era. And any of Christian Cameron’s reading fans who follow him as an author know that he is pretty dedicated to the adage: Write what you know. When he’s not at the keyboard, Christian can be found taking part in reenactments of Ancient Greek military life, exploring the wilderness using historically accurate medieval camping kit, and donning full 14th century armor to test his skills in friendly duels known as Deeds of Arms. But this past summer, Christian’s medieval fighting efforts took on a new and distinctly chivalric spirit when his Western Martial Arts study group decided to use their skills, equipment, and passion for historical detail as a platform for charitable fund-raising, which they called their Deed of Alms. Christian Cameron joins podcast host Scott Farrell to talk about the genesis of this outstanding idea, and how it fits in with the notion of chivalry as he has studied it, as he depicts it through the characters in his novels, and as he and his friends try to live it in the world today. Below: Watch a video of one of Christian Cameron’s bouts at the 2017 Deed Of Alms in Toronto, Ontario, as he and his colleagues strive to use their martial skills to raise money for worthy local charities.